Every variety of worm creates worm castings; obviously. However the most common worm to be used in this process throughout the United States and Europe is called the red wiggler earth worm, the Eisenia foetida. It has been found that these worms produce the best vermicompost as compared to other worms and are the species of worm that should be used. For my own vermicompost, I like to use food scraps left over from meals. The red worms love this stuff and the end result of castings have done wonders for my own vegetable garden. The first way and the easiest way to add vermicompost to your soil is to bury your food scraps in your garden. Get your self a Tupperware bowl (with lid) and as you have left over’s from your meals, coffee grinds from your morning coffee etc., add them to your Tupperware bowl. When your Tupperware bowl is full take it to your garden where you will dig a hole about one and a half to two feet deep and dump the contents of the Tupperware bowl into the hole. Cover the contents with dirt and you are done. The earth worms are already in the ground and they will find the food scraps that you buried. Mark the spot with a stick so the next time you go to bury food scraps you aren’t digging in the same location. Then you simply repeat this process through the year. When it comes time to put you plants in the ground, mix your soil by turning it over with a pitchfork or garden tiller and you will mix in all the vermicompost that was created. You can either build a compost bin or buy a generic Rubbermaid plastic storage container. Drill holes in the bottom for drainage, the sides and top for ventilation and you will have yourself a compost bin. Now add two inches of shredded newspaper to the bottom of your bin, then your food scraps, then another two inches of shredded newspaper, then finally your worms. You can get worms by digging in your garden or looking on your sidewalks and streets after a big rain storm. A couple dozen will do as your worm population will double about every 30 days. Check the bin every few days and when there is very little food scraps left it is time to extract the vermicompost from the bin and start the process over. You can separate the worms from the compost manually by hand, but why do that when you can have them do it themselves. Instead of using the entire bin all at once to create vermicompost, only use half of the bin. When the half you are using is low on food scraps, start using the other half. 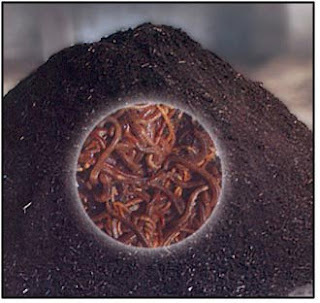 The worms will move to the side where there is food, thus separating themselves from the vermicompost. You might have a few stragglers left, but that’s ok, you can leave them in there and put them in your garden as well. Your worm population, like I mentioned earlier, will double in size every 30 days, so it is good practice to remove some of the worms every time you extract your vermicompost. See how easy that is. If you start using both of these methods today, your soil could be full of all the nutrients that your vegetable garden will ever need, and you can stop buying those chemical fertilizers which offer no value to your soil. We all at some point would like to drop a few of those extra pounds we put on, whether it was from mom’s thanksgiving dinner, or an extra piece of that birthday cake, over time they all add up around the waist line. Lucky for all of us we have the power to do something about it. No it doesn’t mean that you will spend countless hours in the gym training as if you were getting ready for the Olympics, it means we can implement a healthy eating plan today and start losing weight right away. The best part is you can grow some of these foods right in your backyard which saves you some money too! If you want to lose weight, you need to eat right, drink plenty of water and do some physical activity. In this article I am going to focus in on the eating right portion. For optimal weight loss you need to eat small well balanced meals throughout the day. In other words you should consume one meal every two and a half to three hours everyday. Each meal should consist of equal portions of proteins, carbohydrates and green vegetables grown from your own garden. You might be wondering just how much a portion size is because even too much of any of those can be more than enough right? Well, yes and no. You should limit yourself to a portion size, more on that in a moment, for your proteins and carbohydrates, however for your green vegetables you can consume as much as you want. Instead of using a scale or counting calories a good way to remember a portion size is to make a fist. Your clenched fist should be the size of a portion that you are going to consume. This is also the same amount of green vegetables that you should at least eat, although as mentioned earlier you can eat more of them. The reason why you can eat more green vegetables than proteins or carbohydrates is that they are very low in calories and high in minerals in nutrients your body needs, as well as they can fill you up. So if you ever find yourself hungry, reach for a nice big tossed salad of greens. I mentioned earlier how you can grow your own nutrition. What I mean is all of the green vegetables that you can consume, broccoli, asparagus, spinach, lettuce and others, can all be grown right in your backyard. By growing your own vegetables, not only will you be growing the food that will help you lose weight, but the amount of money you will save by eliminated that cost from your weekly shopping trip will add up quickly. To maximize your weight loss, remember to eat frequently throughout the day, six smaller equally portioned meals. Eat one meal every two and half to three hours each day. Make sure each meal has one portion of healthy proteins (chicken breast, lean meat, fish, egg substitutes), one portion of healthy carbohydrates (multi grain breads and cereals, brown rice, potatoes), and at least one portion of green vegetables grown from the garden in your backyard. Follow these simple tips and you can lose 5 to 10 pounds in no time. Just remember to obtain a complete physical from your primary care physician prior to starting any type of physical fitness program or nutrition eating plan. Do you love gardening as much as I do? Do you own a Kindle? Great! Now you can keep up to date on all of the gardening information I post here on my blog. You can now subscribe to this blog via your wireless Kindle and stay on top of everything going on. Nothing screams vegetable garden more than a row of nice tomato plants. To me tomatoes are one of the easiest vegetables to grow. 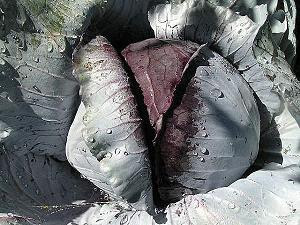 With a little know how, basic gardening skills and the tips I am about to give you, you should have no troubles either. If you are looking to start your tomato plants by seed before your growing season begins, look towards a portable plastic greenhouse for best results. You can find them in any home or garden center for just a couple of dollars. They replicate the greenhouse affect on plants and allow for better germination. Once they come up they are ready to be moved outside. Now that you are ready to plant the tomato plants, regardless of whether you started them from seed or you bought them already up and ready to go, tomato plants need their space. I have my best success when they are at least 6 inches or more apart. Of course if space is limited you can go down to 4 but I would not go any less than that. The last thing you want is for the roots of your tomato plants to be fighting for space and nutrients. Tomatoes love sun, especially the heat also. I have had great success planting my tomatoes in direct sunlight and when the temperatures warm up in the summertime there seems to be no end to the production. Find a nice sunny spot in your garden so your tomatoes will flourish. When it comes to bury your plants, you will want to plant them up to the first set of leaves. Tomatoes have deep rooting systems and the deeper they can get the better your plant will be. I like to keep my tomato plants upright throughout the season. This will require the use of either a tomato cage or driving a stake in the ground next to the tomato plant that measures at least 4 feet out of the ground and sits no closer than two inches to the plant. If going the cage route you simple plant the tomato plant, and place the cage overtop. As the season progresses and your tomato plant gets larger just readjust the plant so it is growing up through the center of the cage and not out of one of the sides. If you are using the stake option, you will want to pound the stake into the ground first (I recommend no less than one foot deep), then plant your tomato plant. When the plants get large enough and start to look like they are falling over you should gently tie them to the stake with some soft cloth and readjust throughout the season as necessary. Both options are fine and it is really a matter of preference. Once your tomato plants reach near 3 foot tall it is time to give them a good pruning. You should remove all of the bottom most layer of leaves to avoid any fungus problems that can occur. Remove any growth that occurs in the elbows or v shaped areas of the plant branches and the stem. They will not produce any tomatoes and are just using up valuable energy that could go towards fruit production. You should be watering all of your vegetables with a deep root watering technique which is watering the plants for a good 45 minutes to an hour. The roots of the plants need to get strong and a great way to do that is with deep watering so they have to reach for those deep water pockets in your soil. So there you have it, my seven tips for better tomato plants that you can use in your next gardening season. Once you have great tasting tomatoes you will wonder why you never tried these methods sooner. A large portion of the population has in some way or another one of the two types of Diabetes. This article won’t go into medical detail as to each of the types, but it will go into the affects that fresh vegetables can have in fighting diabetes. 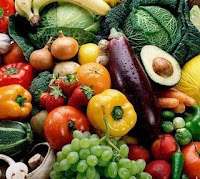 Fresh vegetables are such a positive factor in fighting diabetes, and because they are, you are also presented with a great opportunity to grow your own cure (so to speak). Certain vegetables can be consumed in large quantities because they are low in calories and low in carbohydrates. Buying fresh vegetables at the grocery store can start to add up and get very costly. You can offset that cost by growing your own vegetables. These make up just a few of the many you can grow and eat in larger quantities. Of course you should always speak to your primary care physician as to which vegetables offer your condition the better benefits and then you can grow them to help with any costs you might incur at the grocery store. For instance, a spinach plant can produce good tasting healthy spinach throughout an entire growing season in most parts of the country. The average cost for a bag of fresh spinach is around $2.99. That one bag would last you about a week. If you grew your own spinach, three plants could give you enough of a harvest for half of the year, saving you money, and allowing you to eat more of it. The same holds true for any vegetable and as the studies have shown us, eating healthy fresh vegetables helps in the fight against diabetes. Just remember to eat them fresh when you can, such as in a salad, or uncooked. The nest best thing would be, baked, broiled or steamed. You could also grill your vegetables and get a good flavor. Also fresh is always better than frozen, so try to ingest the fresh vegetables not too long after you pick them. With the cost for transportation always increasing due to high oil prices that will lead to higher costs for store bought vegetables. Save that cost and walk out your back door and pick the vegetables you need to help fight diabetes. They are better than store bought vegetables anyway since you are the one growing them the way that you want. You know that no harmful chemicals are being sprayed. You know that you have taken the utmost care for them because you will invariably be the one eating them. Take the steps necessary to start growing your own vegetable garden today. It will help save you money at the store and fresh vegetables will help in your fight against diabetes. Composting is the process of organic material breaking down. The process of breaking down is more commonly known as decomposing. There is an entire ecosystem of earthly creatures, some you can see like worms, and many you can not like bacteria, that are working hard for you to give you great compost. With that said there are still some things you can do to either speed up the process or make it more efficient. I have listed some of my tips below that have helped me with my gardening adventures and I am sure they will help you as well. Oxygen is required by all living organisms. For humans we need it to breathe and stay alive. The ecosystem in your compost pile is the same way. They need oxygen to live, throve and prosper. So when you build your compost bin, whether it is a wooden box or a store bought one, make sure there is plenty of ventilation holes in it so oxygen can get in. There is an optimal temperature range for compost to decompose efficiently. Starting at 90 degrees Fahrenheit up through 135 degrees Fahrenheit has been shown to be the best. Although some experts will say it can go as high as 155 degrees Fahrenheit, if you keep it within the range above you should be ok. Invest in a compost thermometer to monitor the temperature of the middle of the compost pile. When that temperature starts getting near the top range it is time to work the pile by turning it over. This keeps the center a nice level for your decomposing ecosystem to work. Your compost pile must remain moist. Let’s face it, worms, bugs, bacteria and fungi all like it a little more wet than you and if you want to excel at decomposing your organic material then misting down your pile is a great way to go. You do not need to drench it, but only apply enough water to where the pile remains moist and damp. Would you pick up a entire steak and put it in your mouth? Or an entire zucchini for your vegetarians out there? Of course you wouldn’t, or at least I hope not. Well your earth workers do not want to shove an entire egg shell in their mouth either. What I am getting at is if you want the optimal performance of decomposition shred or grind your material before you put it in the bin. It makes it easier for your workers and will speed up the process. Get a good mixture of various organic material together. You could make compost out of just grass or just leaves, but by combining them you are creating a compost that covers all of the nutrients needed by plants in your gardens. Your compost bin should consist of leaves, grass, twigs, pine cones, newspaper, paper junk mail, and old cotton clothing (all metal and plastic removed of course). As you can see they are straight forward tips and advice that you can start implementing today for better compost. You get up early in the morning, go out to your car, put the key into the ignition, turn the car on and you are ready to leave, except the fact that the dew froze overnight and now you have frost on your windows. You can’t see out of them therefore you get out the trusty old ice scraper and start chiseling away at the stuff so you can get on your way. Whether it’s your earlier morning drive or making sure the vegetables in your garden do not get wiped out you should be keeping an eye on the frost conditions in your are. By monitoring the conditions you can be well prepared to handle frost when it occurs. One of the best natural solutions to make your plants healthier is through the use of compos tea. Compost tea is the process by which you use compost to brew a liquid solution that you will then “feed” to your plants. Compost tea can be applied to vegetables, trees, bushes, flowers, or in short anything that you grow that you want to get healthier. The first step is to get compost. You can buy compost from a local nursery or garden center but the better option is to make your own. You make compost from organic material. In other words grass, leaves twigs, and food waste to name a few. You then take the compost and mix it with water. After about an hour of soaking you can use the compost enriched water on your plants and you will get excellent benefits, but if you really want to get the most out of your compost tea, you have to brew it. To brew compost tea you simply add an air pump to pump in fresh oxygen into the water as well as one to two ounces of molasses. What you are doing is creating an environment where bacteria that live in the compost will thrive. After brewing for a couple of days separate the compost from the liquid with a strainer such as cheese cloth or an old screen and you are all. Put the liquid in a watering can or sprayer and let your plants have it. It is the most natural type of fertilizer you can ever apply to your plants that no chemical can reproduce. Compost tea introduces healthy minerals and nutrients into the soil as well as “good” bacteria that work hard in the underlying ecosystem to create an environment for the roots of your plants to thrive. Compost tea has also shown to prevent many diseases found in plants due to the microbial population found in compost tea. You should apply compost tea first thing in the morning and if you are putting it directly into the soil it is ok to apply during rainy conditions, however if you are applying it directly to leaves then you should wait for a dryer day. Studies have shown it is best to use your compost tea within 4 to 6 hours after you brew it. Remember you have living organisms in that tea and having it sit around too long can kill them and render your tea useless. Besides you have been waiting 2 days to use it while it’s been brewing. The definition of Organic Foods means that these foods are either grown or made per a set of criteria or standards and before they can be called organic they must obtain an organic certification. In order to achieve the organic certification the foods must void of most synthetic chemical inputs such as fertilizer, pesticides, antibiotics (in regards to live stock), any food additives and so on. The farmland that has produced the food must have been free of any chemical inputs for a minimum of three years. The grower of the food must keep a written detail account of production and sales records. Certified organic products must be kept separated from those products that have not been certified and periodically the site growing the organic food will be inspected. In some countries certification of organic foods is a strict process overseen by that countries government. But here in the United States the certification can be handled by third party companies whose sole purpose is to certify growers (or manufacturers) of organic products. Since we are specifically talking about growing foods organically in this article you would fall under the realm of farming. In order to be considered an organic farmer you must study organic standards, make sure the area in which you will be farming the crops is in complete compliance with organic standards, obtain an on-site inspection along with passing an oral interview and of course the annual fee to keep the organic certification which can run anywhere from $400 to $2000 depending on the size of the operation. All agencies that hand out that hand the certifications must first be approved by the United States Department of Agriculture. The term certified organic is protected by legislation here in the United States so that the consumer purchasing a product for the sole purpose of it being organic is kept safe. In other words, it is to prevent manufacturers from misusing the term certified organic to deceive the public. There are three levels of organic rating in the United States. The top level says that the products have been certified therefore the manufacturer of that product can use the term certified organic. The second level says that the products being manufactured have used at least 95% organic ingredients therefore can put the organic label on their products. The third level of which at least 70% organic ingredients were used can only use the seal “made with organic ingredients”. Anything less than 70% can not use the term organic anywhere on their labeling. 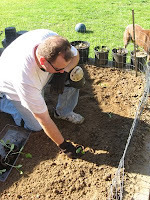 As you can see becoming an organic gardener, a certified one that is, can be a lot of work. However, if you truly believe in going organic and growing your vegetables and fruit in this manner then the work will be well worth it for you. Frost forms as a result of the surface of some object being chilled below the dew point of the surrounding air. The dew point is the temperature at which air must be cooled in order to be condensed into water. When the chill point is met crystals form on the surface of the object and appear as ice. The most common form of frost on vegetation is Hoar Frost also known as Radiation Frost. This occurs when ice crystals form overnight due to drops in temperature and heat loss because objects become colder than the surrounding air. Many plants can be damaged by the affects of frost and some, such as tomatoes, will die. To know which plants will survive a cold night, refer to the back of the package of seeds that you bought as they have excellent instructions as to temperature ratings. If you bought your plants already grown from a nursery or garden center then it is best to check with someone there so you do not plant them too early. However in a moment I will talk about protecting your plants in the event an unseasonable frost should occur. The United States Department of Agriculture has an excellent map on first and final frost dates for various regions of the U.S. They have broken the country down into zones. Find your zone and you will be able to calculate when you should start planting your vegetables. Even with the best calculations sometimes Mother Nature just doesn’t cooperate. As was the case in May of 2009 when three weeks into the month frost conditions occurred in the southern New Jersey and eastern Pennsylvania regions. Until there is a consistent level in temperatures you should monitor the overnight conditions in your area which can be easily done by watching your local weather or the weather channel. If you have planted your vegetables and they call for a potential of frost, you can and must take precautions to ensure that they, your vegetables make it through the night. The best method for protection from frost conditions is the use of plastic milk containers. What you want to do is cut the top of the container off, but not too much so the plant won’t fit, and cover the plants with them. This creates a greenhouse warming affect for your plants. The container traps air which stays a constant temperature, never allowing it to drop below the dew point and create frost for the surrounding plant. When morning comes and the cool temperatures have subsided for the day, remove the plastic milk containers and let them soak in the sun and air. They should be fine. For gardeners, frost can be a devastating condition and literally wipe out any growth we might have. But there are remedies, actions and preventions we can implement that will increase our chances of success through frost weather conditions. Vermicompost, also known as worm castings, is the end result of worms feeding off of organic material such as food waste. Vermicompost has shown in studies that it contains much needed water soluble nutrients your vegetables, fruits and flowers crave. You can either make your own vermicompost by adding worms and food scraps to a ventilated container or buy vermicompost commercially. Either way is fine and if just adding nutrients to your soil is not enough proof to use vermicompost than read these three other ways to justify its purpose. I have mentioned this already and that is vermicompost adds much needed nutrients back to the soil. Each growing season your plants will use certain nutrients in order to flourish. If you do not replenish those nutrients, your plants will eventually stop growing or die. Also, vermicompost enriches your soil with various micro-organisms by adding enzymes such as phosphate and cellulase. Vermicompost also more deep burrowing earth worms already in the soil and will actually increase your soil’s water holding capacity. Your plants love vermicompost obviously for the nutrients it provides but also for the fact that vermicompost has been shown to enhance germination and increase crop yields. Recent studies have even shown an improvement in root growth and structure of various plants. Since you are using your food waste to create vermicompost, it goes without saying that you when you do this you are adding less garbage to local landfills. And because you are not simply throwing the food away, it reduces the amount of biowaste which in turn reduces potential contamination in our streams and waterways. Also in some parts of the country, in large scale production centers for vermicompost, jobs have been created. Somebody has to do the work right? Vermicomposting is a low cost way to create natural fertilizer, thereby making it possible to add much needed nutrients to the soils of a lot of less developed agricultural regions. Large scale productions of vermicompost have been shown in some studies to have a higher yield of valuable soil microbial probably because of the feedstock waste available. This does not mean that your homemade vermicompost is not adequate enough for your gardens though. You should definitely start implementing a process in creating your own vermicompost so that you can add it to your soil so your plants can start enjoying all the benefits mentioned above and more. If you want to learn more about the vermicomposting process there are a number of good books on the market and you can visit the Cooperative Extension Service website which is a division of the United States Department of Agriculture. The COE is an informal educational program that exists only within the United States that was designed for the sole purpose of helping people with research based knowledge. Vermicomposting is a must for any gardener that wants to improve their plants and the soil that their plants grow in. If you are a gardener or an aspiring one, and you are not creating your own vermicompost, then you should be. Start your vermicompost bin today. Bruce is the co-author of the book Vegetable Gardening for the Average Person. It is a practical easy to follow book that teaches gardeners everything from composting techniques, aeration and frost conditions, to choosing the right tools and picking the right seeds. To learn more about Mr. Tucker you can visit: AveragePersonGardening.com. Vermicompost is the end result of organic material such as food waste after it has been digested by some species of earth worm. Commonly referred to as worm castings, vermicompost contains water soluble nutrients and bacteria that make a great organic fertilizer for your garden. The process in which you feed a worm organic material and turn it into vermicompost has an actual name called vermicomposting. Although every worm produces worm castings, the worm best for the job to produce quality vermicompost for your garden’s soil is called Eisenia foetida or the red wiggler earthworm. Most of North America will use this species of worm, but if you live in a tropical part of the world, look towards Perionyx excavatus (Blue worms) and if you have a more acidic soil then use Eisenia hortensis (night crawlers). Vermicompost can be used to brew compost tea, a rich elixir that is sprayed on the plant’s leaves and stem as well as added to the soil so the roots of your vegetables can absorb the tea’s nutrients, and vermicompost can be mixed directly in with your soil. 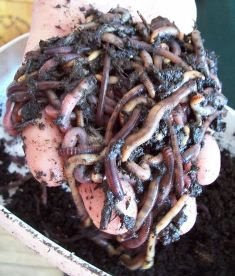 You can buy vermicompost at many nurseries or garden centers, but you can actually make your own with a box, some worms, and a little water and some time. The easiest way to make your own is to buy a large plastic or rubber container (similar to one you would store household items in), drill holes in the lid, and the sides for air ventilation, and drill holes in the bottom for water drainage. Then put down two inches of shredded newspaper, followed by shredded leaves, grass clippings (in limited quantities) and your food left scraps followed by another two inches of shredded newspaper. To get some worms just look on your sidewalks or in the street after a heavy rainfall. They will be crawling everywhere. Their homes get flooded and they go to higher ground where it is wet but more tolerable. You simply put the worms on top of your shredded newspaper and put the lid on. The worms will work their way down through the newspaper and find the food waste. It is very important that you keep the contents of your bin moist. Worms need a moist environment in order to thrive. A simple misting of the contents of the bin on a daily basis should suffice. As a side note, place something underneath the bin to catch any water drainage. Any moisture you capture you should then be dumped back into the bin. You will know when it is time to retrieve and harvest your vermicompost by simply seeing that very little or no food scraps remain. There are a couple of ways to harvest the vermicompost. The first way is to dump the entire contents out, and remove the worms by hand. The second way is to divide your rubber container in half initially by only placing food scraps on one side of the container. Then when it is time to harvest the vermicompost you add food scraps to the other side. When you do this the worms will move to the side where there is food leaving you with a near wormless side of quality vermicompost. Vermicompost is a great way to add much needed nutrients to your garden’s soil and the best part is you can do make it right in your own backyard all year round. Bruce is the co-author of the book "Vegetable Gardening for the Average Person: A guide to vegetable gardening for the rest of us". It is a practical easy to follow book that teaches gardeners everything from composting techniques, aeration and frost conditions, to choosing the right tools and picking the right seeds. To learn more about Mr. Tucker or to inquire about the book you can visit: http://www.averagepersongardening.com/. Gardening doesn’t simply have to be just your flower bed or vegetables growing in your yard anymore. Now it can be a full fledged vacation. Here are some destinations that you can travel to if you want to get away and still enjoy your love for gardening. Nestled on 55 acres on Vancouver Island, it ranks as one of the world’s greatest garden spectacles. Started in 1904 by Jennie Butchart, she began sculpting the landscape to meet a Victorian style. The Butchart Gardens boasts 26 greenhouses, and a variety of flowers that bloom throughout the year. You can go on self guided and group tours as well as eco-friendly boat tours. They boast a gift shop where you can buy seeds of the flowers they grow as well as a knowledgeable staff to help you in your own gardening ventures. If you love gardens, this is a great one to see. Beyond the many historical and governmental attractions of the nation’s capitol sits the newest addition to the botanical gardens which opened in October of 2006. The National Gardens has four gardens, which consist of a seven bed regional garden, a first ladies garden, a formal rose garden and a butterfly garden. The gardens have a great backdrop of the US Capitol and best of all there is no cost to go in to see them. When you think of Africa most people right away think of safaris as a vacation getaway, but located in Cape Town South Africa are the Kirstenbosch National Botanical Gardens. These gardens only grow indigenous South African plants. Located on 528 hectares, the gardens also boast a natural forest. Founded in 1913, it boasts a well staffed visitor center, and educational facilities to learn about all of the plants being grown there. The Sissinghurst Castle Garden was created in the 1930s by Vita Sackville-West (poet and gardening writer) and her husband Harold Nicolson. It is one of the most well known and renowned gardens in the entire United Kingdom and draws visitors from all over the world. The garden is designed to look like a series of rooms of which each room has its own unique design and theme. First opened to the public in 1938, Sissinghurst boasts Garden suppers, lecture luncheons, estate walks, local food events, a literary festival and monthly farmers’ market. It also has a fully operational vegetable garden that supplies fresh fruits and vegetables to the restaurant on the premises. As if you needed another reason to go to Hawaii right? Located on the Kona side of the island 22 miles south of Keahole Airport, this 15 acre botanical garden focuses on the study of Hawaiian people and the plants they grow. The garden boasts over 200 species of plants, self guided and group guided tours that can last for up to an hour. Also, if you hit the gardens at the right time of the year, you will get to experience their native insect house that features the Kamehameha butterfly one of only two butterfly species native to the island. After visiting these five garden destinations your eyes will be opened up to a whole new world of gardening that you never thought or knew existed. This is my first post of my gardening blog! 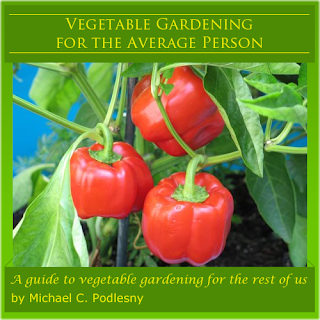 Thank you for taking the time to visit my blog as I hope to help continue your gardening education beyond my book, Vegetable Gardening for the Average Person: A guide to vegetable gardening for the rest of us, through my series of writings.